Are Ionic Air Purifiers Safe? What is a HEPA Filter? ﻿Do Air Purifiers Remove Odors? There are several key features to look for when hunting the best car vacuum: lightweight, versatile, but plenty of power. The following are the best vacuums for car detailing. If the V7 Trigger is too expensive, or you just want something a little different, there are plenty of other options. Below we’ve listed what we think are the best 7 car vacuums on the market. This quick list below includes the top 7 car vacuums we’ve reviewed to date. Or quickly compare each model using the table below. The Dyson V7 Trigger has a similar body style compared to the V10, but this model is not a 2-in-1. The Trigger is designed to just be a handheld vacuum and is able to hit a lower price point because of its limited use. The V7 Trigger has about a 30-minute run time and the same size dust bin as the full-size Dyson V7. Accessories typically include a crevice tool, dusting brush, and motorized brushroll. Regarding cleaning performance, the V7 was equally as impressive as the mode expensive V10. When tested on low carpet (the closest comparable to automotive upholstery), it scored 99% in terms of overall cleaning performance. The Trigger is available as a V7 or V6. Both offer similar performance, but the V6 will be less expensive. Read our Dyson V6 Trigger review here. Less expensive compared to full-size Dysons: If you like the power and design of a Dyson, but don’t want the higher price tag and don’t need a 2-in-1 stickk vacuum, the Dyson Trigger is an excellent option. Long run time: At 30 minutes, the Dyson Trigger still has a sufficient run time for most automotive cleaning jobs. More expensive that others: Again, compared the traditional handheld models, the Dyson V7 Trigger is still going to be more expensive than other traditional handheld models. Struggles with large debris: The V7 Trigger struggles with large debris types, like cereal in the backseat or large dirt and debris on the floorboard. The Bissell Pet Hair Eraser is a cordless handheld vacuum with a long body and a motorized brushroll cleaning head. 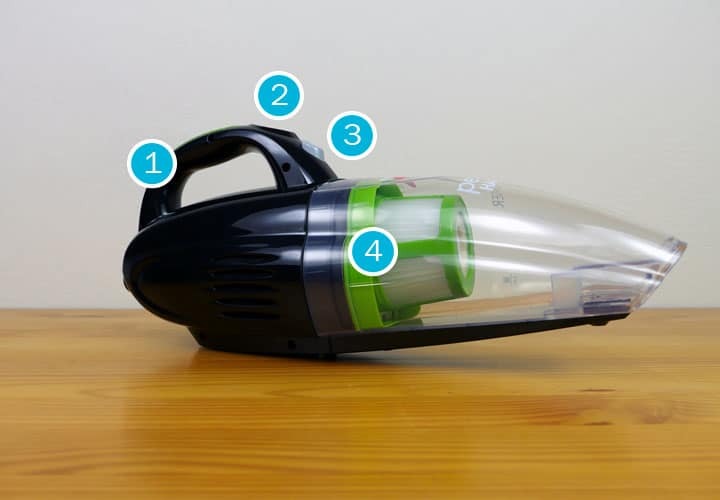 There are two simple controls on this vacuum; one to turn the vacuum on or off and one to release the dust bin and clean the filter. But what parts come with it? This small vacuum is nice for cleaning cars because it is lightweight and cordless. The longer body is a little awkward for getting into tight areas, but it does have some nice accessories, including a crevice tool, upholstery tool, and motorized brush. Regarding cleaning performance, this model did pretty good. When tested on low carpet (the closest comparable to automotive upholstery), it scored 96% in terms of overall cleaning performance. It’s a definite contender for the best car vacuum for pet hair (specifically). Read our full Bissell Pet Hair Eraser review here. Cordless Power: The Bissell Pet Hair Eraser is cordless and has a 15-minute run time. Great for Pet Hair: This handheld comes with a motorized brushroll that helps with pet hair. In addition, it also comes with a crevice tool and upholstery tool for variable use. Long Charge Time: This vacuum takes a while to charge, especially considering the shorter run time. 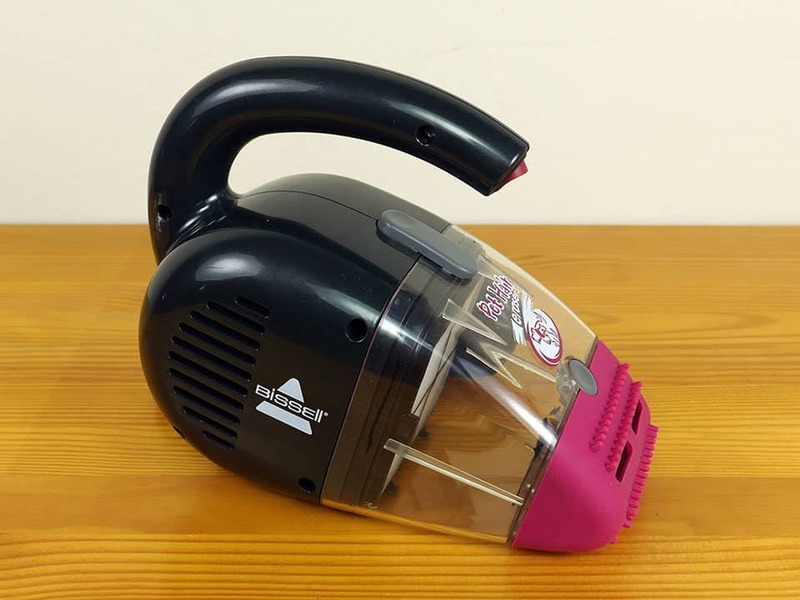 Fading Suction: The suction tends to fade after continual use. Combined with the short run time, it really limits the amount of time that this vacuum is performing at its best. Similar to the Bissell Pet Hair Eraser (cordless), the Shark Pet Perfect also has a long and narrow body style. There are two buttons on this vacuum, one to turn it on / off and one to release the dust bin and filter for cleaning. What tools does Shark Pet Perfect 2 come with? The Shark Pet Perfect comes with a motorized brush for tackling pet hair, a soft dusting brush, and a short crevice tool. This model is lightweight and easy to carry, but may feel a little awkward to use in certain parts of your car. Regarding cleaning performance, this model did well. When tested on low carpet (the closest comparable to automotive upholstery), it scored 97% in terms of overall cleaning performance. Read our full Shark Pet Perfect 2 review here. A Pro At Pet Hair: The motorized brushroll was excellent at cleaning up pet hair from upholstery. Multiple Accessories: It comes with three different accessories and cleaning heads, making it a bit more versatile than some other more basic models. High Replacement Costs: Concerning maintenance, the costs of replace the battery is high. A new battery costs as much as entire new unit. 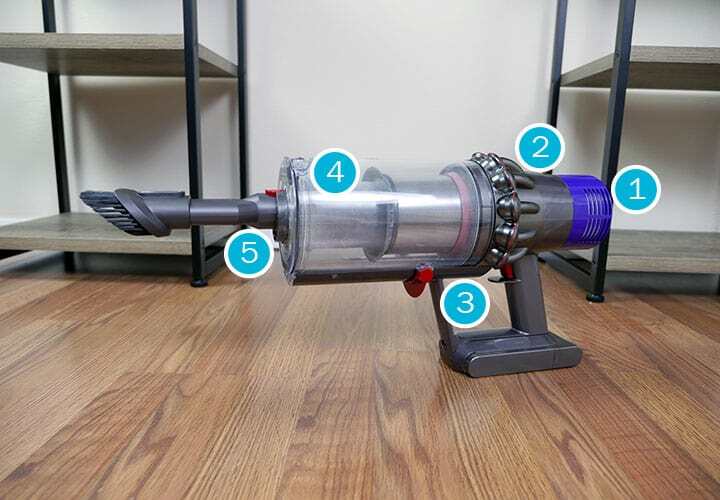 Awkward Body Size: Not unlike the Bissell Pet Hair Eraser cordless, the Shark Pet Perfect 2 is a little awkward when trying to access hard-to-reach places inside an automobile. The Dyson V10 cordless is a 2-in-1 vacuum that doubles as a stick vacuum as well as a portable handheld, which works great for cleaning your car. The V10 is a part of the Dyson V-series and is currently the most advanced model. It has a 60-minute run time, numerous cleaning tools and two different cleaning heads when using the V10 as an upright stick vacuum. If you’re looking for something to keep in your car, the V10 may be a bit of overkill, but if you’re looking for a car vacuum that doubles as a nice vacuum for cleaning the inside of your home as well, the Dyson V10 is an excellent option. RELATED: Like the V10, but want something a little less expensive? Check out our reviews of the Dyson V8 (40-minute run time), Dyson V7 (30-minute run time) or Dyson V6 (20-minute run time). They have many of the same features and body style as the V10, but with less suction, a shorter run time, and a lower price tag. Regarding cleaning performance, the V10 was excellent. When tested on low carpet (the closest comparable to automotive upholstery), it scored 99% in terms of overall cleaning performance. Read our full Dyson V10 review here. Long time time: The Dyson V10 can run for up to 60 minutes before needing to juice up. 2-in-1: Not only is the V10 a powerful car vacuum, but the fact that you can use it as a stick vacuum as well makes it more versatile and increase the overall value. Pretty expensive: If you’re just looking for a traditional handheld and don’t need all the bells and whistles or 2-in-1 body style, you may find the V10 to be a little pricey. The Black & Decker 16V cordless handheld has a bit of a different shape from other models above. It has rounder edges and a few more buttons. It only comes with one cleaning head and that is a nozzle tool that helps to reach tight crevices. There is an additional notch that allows the cleaning head to rotate to fit into different areas. In addition to the single cleaning head, this vacuum also comes with a charging base. Regarding cleaning performance, this model did great. When tested on low carpet (the closest comparable to automotive upholstery), it scored 98% in terms of overall cleaning performance. Read our Black & Decker 16V review here. Strong suction: For a handheld, we were surprised at the sheer amount of suction this little vacuum had. Lightweight design: At only 3 pounds, this is one of the lightest handheld vacuums we’ve tested to date. Few Accessories: Doesn’t come with much in the way of accessories and attachments. Awkward charging base: The charging base was a little awkward, in my opinion. We found the base to be a bit unstable. The Bissell Pet Hair Eraser is a corded model, but this compact handheld is truly impressive at tackling small messes, especially cleaning pet hair from upholstery. It has a smaller dust bin, but the small dust bin also allows for an extremely compact size. Despite the size, this vacuum is arguably the best car vacuum for pet hair. The corded power and rubberized brushroll work together to great effect. It comes with two cleaning heads, one rubberized head for cleaning pet hair and one hard nozzle for cleaning surfaces. Regarding cleaning performance, this model was great. When tested on low carpet (the closest comparable to automotive upholstery), it scored 97% in terms of overall cleaning performance. Read our Bissell Pet Hair Eraser review here. Great for pet hair: The rubberized nozzle was exceptional at cleaning pet hair from upholstery, like car seats. Lightweight and easy to store: Its compact design was lightweight and easy to store. Depending on the model of your car, this may be able to fit in the center console or tucked away elsewhere. Corded: This model is corded and the cord is not exceptionally long, at that. This may make it difficult to clean certain areas of your vehicle without a close power outlet or an extension cord. Fan blower: The fan located at the back of the unit has a tendency to blow debris around, especially off of slick surface like leather seats, or hard plastic trim of an automobile. 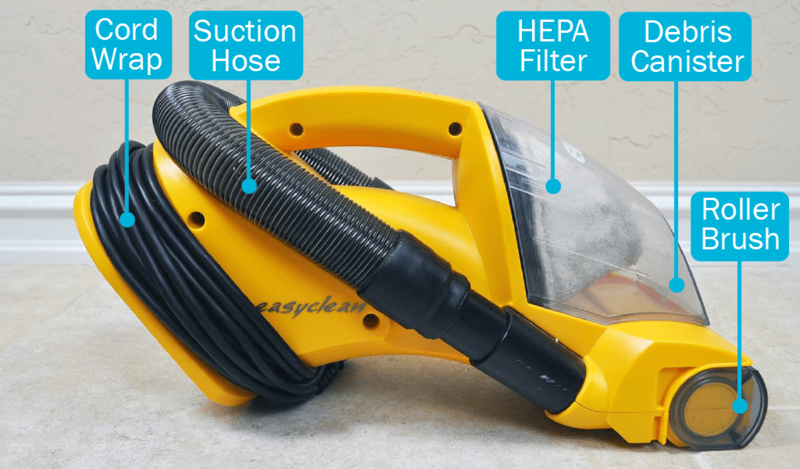 The Eureka EasyClean handheld vacuum is a corded vacuum, but with a different look and feel compared to the smaller models. Is it good for car detailing? Instead of having a long slender neck with a narrow cleaning head at the end, the Eureka EasyClean has a wide cleaning path and a rotating brushroll, more like a traditional vacuum. This is a great option for vacuuming cloth seats, as well as general car detailing. There is also an extension hose that comes with a crevice tool which helps to access nooks and crannies in a vehicle. This is a corded model, which is not as convenient as cordless, but the cord is long and the suction power does not noticeably fade with continued use. Regarding cleaning performance, this model was okay. When tested on low carpet (the closest comparable to automotive upholstery), it scored 84% in terms of overall cleaning performance. It seems appropriate to note that the majority of the problem was cleaning up cereal using the brushroll. When cleaning up large debris (like cereal) with the extension hose and using the brushroll for the other debris (rice, kitty litter, and sugar), it had an improved overall cleaning performance of 96%. Read our Eureka EasyClean review here. Wider cleaning path: The wider cleaning path and spiral brushroll makes this vacuum feel more like a traditional vacuum, but with the benefits of a compact size. Makes it a good option for cars that have more wide space to clean. Extension hose: The extension hose is something a little less common compared to most handheld vacuums. But this extension makes it easier to clean tight areas with ease. It also comes with a crevice tool that easily attaches. Difficulty cleaning large debris: If you have large debris messes like cereal, beads, etc, you won’t be able to use to central brushroll. Only the extension hose tool can capture these larger debris types, which could be an issue for some users. The filter: The filter itself is a little awkward and it can be difficult to easily clean it. In most cases, you’ll need to pull the debris off of the filter using your hand which can be messy, not to mention unhygienic. When you’re in the market for a high-performing car vacuum, there are a few key factors that you may want to be on the lookout for. If you’re going to be dragging it around your car and on-the-go, having a lightweight vacuum is a big factor. There is a wide range of portable handhelds that easily fall under 10 lbs. What about even lighter vacuums? Some of the most compact units come in closer to 5 lbs. For a more powerful and robust unit, you may want to look into stick or canister vacuums which typically range from 10-15 pounds. While these vacuum types are more expensive, they also generally come with larger dust bins and stronger suction. 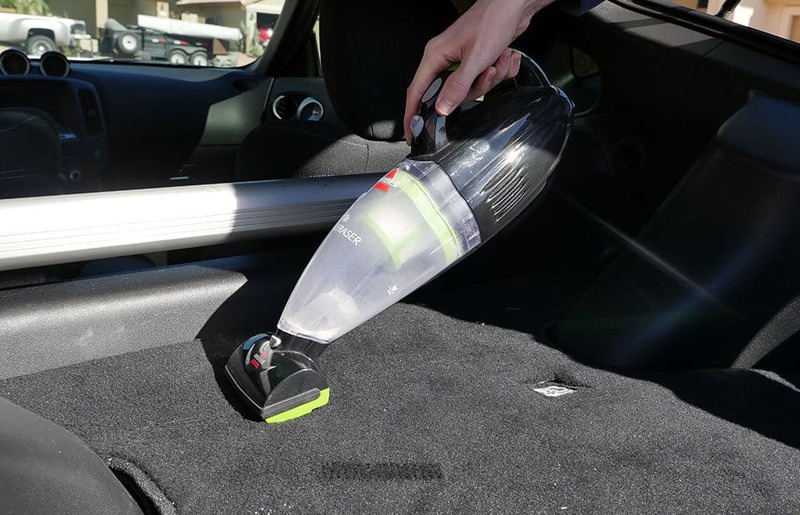 A cordless vacuum certainly isn’t a requirement to vacuum out a car in your own garage, it generally is a requirement for vacuuming on-the-go. Cordless vacuums have the benefit of being portable and easy to maneuver, but sometimes can lack power and run time. Some car vacuums can be powered by your cigarette lighter. For many users, this is the ultimate convenience, however, the relative power vs. lithium ion batteries or corded power, usually isn’t there. Nevertheless, for the right user it’s a good option. So what’s the best car vacuum cigarette lighter? One of the most popular choices on the web is the ThisWorx TWC-01. Comes with a tote bag and useful accessories. Additionally, the LIBERRWAY 12 volt car vacuum and BLACK+DECKER BDH12000FVAV 12V are both solid choices. All 3 of the above are 12 volt powered through the cigarette lighter. For most I generally think that a more traditional cordless handheld vacuums offers better performance. Even so, if convenience and portability is key, any of these cigarette lighter car vacuums can be a good fit. Again, accessories are not necessarily required, but can make your cleaning task significantly easier, depending on the mess that you’re cleaning. The Shark Pet Perfect 2 is a cordless handheld vacuum that comes with a motorized brushroll specifically designed for pet hair. This is a low-cost, high-quality option of pet hair is your main concern. But if you don’t have pets, this accessory may be less useful to you. Other models, like the Dyson V10 comes with a wider selection of tools. In the case of the V10, it comes with a combination tool, crevice tool, soft dusting brush, and mini-motorized tool. Which Model is the Best Value? For a great value, it’s hard to beat the Bissell Pet Hair Eraser models. Bissell offers two different versions of handheld Pet hair Erasers, one model is corded and one model is cordless. The benefits of the corded Pet Hair Eraser is the impressively low price tag. This model is extremely compact and surprisingly effective at cleaning up pet hair. Both of these models come in at a very low price point and make them a smart choice for a great value when looking for the best car vacuum. RELATED: Want more options? Click here to check out our recommendations for the best handheld vacuums. What’s the Best Car Vacuum for You? Both of these models scored 100% on cleaning up large debris during our cleaning tests. All of these models weigh less than 5 pounds and have their own advantages and disadvantages. The corded Bissell Pet hair Eraser is certainly the most compact, but is also restricted by the cord. The Dyson V7 Trigger is cordless, but it’s also significantly more expensive than the other models. As you can see, depending on exactly what you’re looking for, there are many different car vacuum models that may be right for you. Need help deciding? Click to shoot us a message and we’d love to help you make a selection that is right for you. Save 30% off your entire Arhaus.com furniture order. No code required. Expires 4/30/19. Amazon.com Disclosure: As an Amazon Associate I earn from qualifying purchases. Sitemap | Privacy | Terms | Data Request | Copyright © 2019 Silver Poodle LLC. All Rights Reserved. This tells us what our visitors look at while on ModernCastle.com. We use this information to help improve user experience and content on ModernCastle.com.